340 HP, 4552 cc SOHC-V V12 engine, three Weber 42 mm DCZ/3 carburettors, four speed manual transmission, independant front suspension by double wishbone and coil springs, rear live axle with semi-elliptic leaf springs and trailing arms, four wheel hydraulic drum brakes. Wheelbase : 2.600 mm. Restored by Wayne Obry after 30 years of ownership. 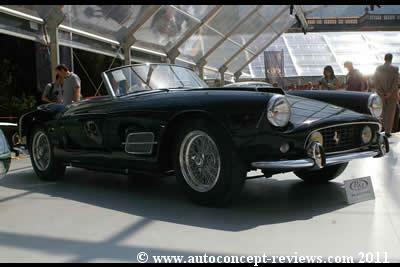 First shown at Turin Motor Show 1955. 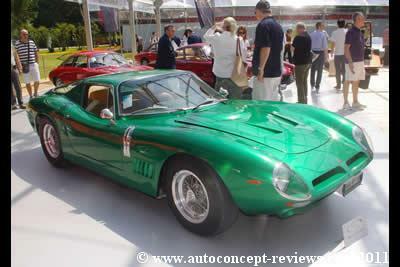 It appeared on various concours such as Pebble Beach 2004 (class winner), Cavallino Classic 2005, Villa D'Este,... One of ten 375 MM Berlinettas built. 140 BHP, 3996 cc inline six cylinder engine with hemispherical combustion chambers and triple Stromberg carburettors, Wilson four-speed pre-selector gearbox, independent front suspension with transverse leaf spring, leaf spring and live axle rear suspension ans four wheel drum brakes. Wheelbase 2,650 mm (104.33"). 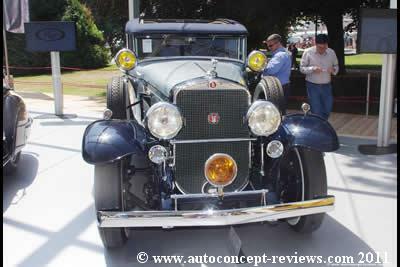 One of only eleven examples with Second Series "New York" Figoni coachwork. Rare Factory sunroof. Sophisticated race-bred, short wheelbase T150-C SS Talbot Lago chassis. 190 bhp, 1.985 cc. in line DOHC four cylinder engine, two Weber 40 DCO/A3 carburettors, four speed manual transmission, independent front suspension, live rear axle, hydraulic four wheel drum brakes. Wheelbase 2,250 mm (88.6"). Seventeen examples were built and became favourite sports racers for privateers the world over. 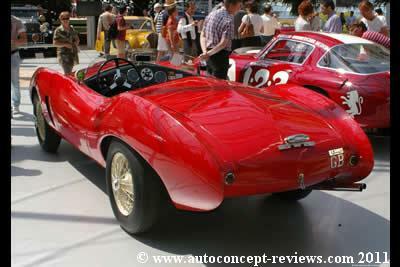 This was the first Ferrari designated with the now legendary name "Testa Rossa". 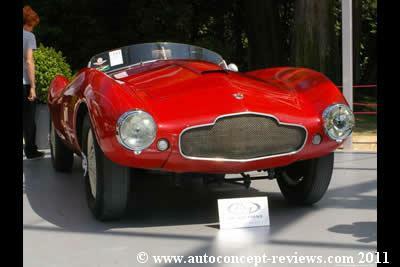 The four cylinder engined type 500 TR was introduced in 1956 and was the successor to the 500 Mondial. 240 bhp, 2.953 cc. overhead camshaft alloy block and head V 12 engine, four speed manual gearbox, independent front suspension via A-arms, coil springs and telescopic shocks, and rear suspension via live axle, semi-elliptic springs and hydraulic shocks, four wheel hydrailic disc brakes. Wheelbase 2,600 mm (102.4"). 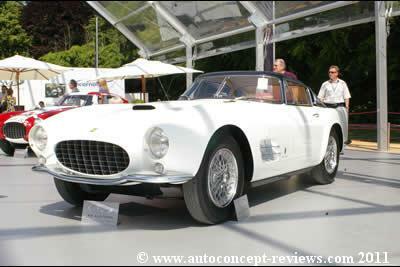 The California Spyder, in contrast to the luxurious custom built 250 cabriolets that preceded, was intended for the client in search of a fast, sparsely equipped cabiolet Ferrari sports car, an open counterpart to the Tour de France berlinetta, perfect not only for spirited driving along the Pacific Coast or Cote d'Azur but also all out racing. 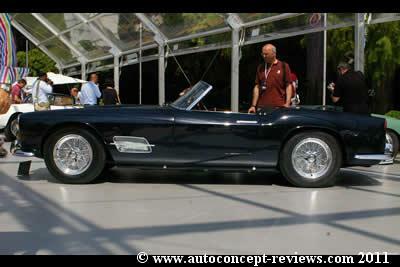 A total of 50 long wheelbase California Spyders were built. 175 bhp, 1964 cc. six cylinder in line engine, three Weber 40DCOE carburettors, five speed gearbox, independent front and rear suspensions with triangular wishbones, coil springs, telescopic dampers and anti roll bars, four wheel disc brakes. Wheelbase 2,620 mm (103.1"). Introduced at the 1967 Geneva Motor Show, the P200 Marzal was the result of a close collaboration between Bertone and Lamborghini. In fact, it was the materialisation of the ambition shared by Nuccio Bertone and Ferruccio Lamborghini to give birth to a true GT with confortable seating for four, offering high performance and redefining the very concept of grand touring. 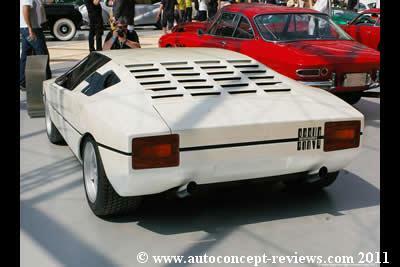 The Marzal featured a unique prototype engine developped by Lamborghini that would never see production. 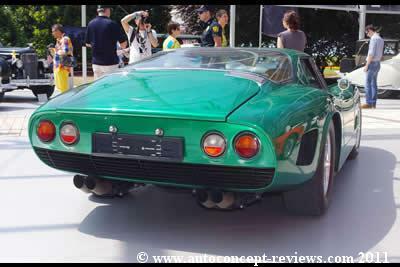 It was a tranversely mounted in line six cylinder wich was essentially a rear bank of a Miura 3,929 cc. 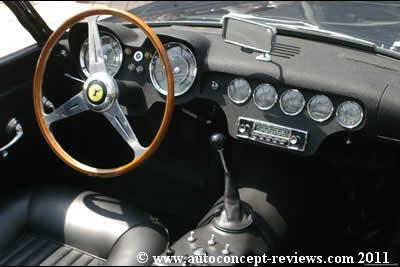 V12, fed by horizontal Weber carburettors and mated to the standard five speed transmission. 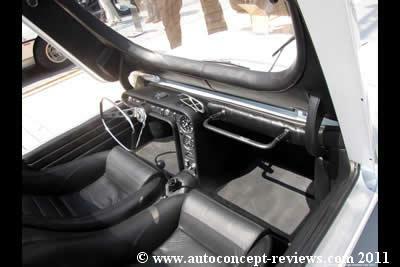 The engine was turned 180 degrees compared to the Miura's layout so that it was behind the rear axle, therefore making it more a rear- than mid-engined layout. 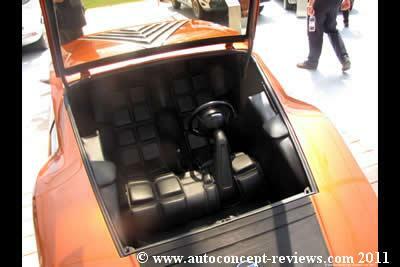 This obviously freed up interior space so that four passengers could seat confortably. The radiator was fitted right at the rear, which meant the passengers could take some luggages too, as the long front bonnet housed 11 cubic feet of loading space, along with a 21 gallon fuel tank. 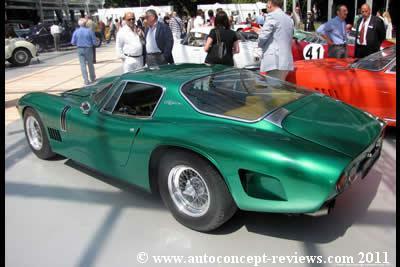 The chassis was based on a much modified Miura chassis extended by 120 mm to accomodate those extra two passengers. 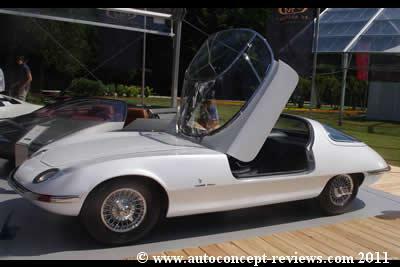 As the overall lenght was still relatively compact, Marcello Gandini elected to use a pair of long gullwing doors rather than a constrained four door layout. This enabled to fit large windows which, combined with a lightly smoked glass roof, helped create a very airy feeling inside the cabin. 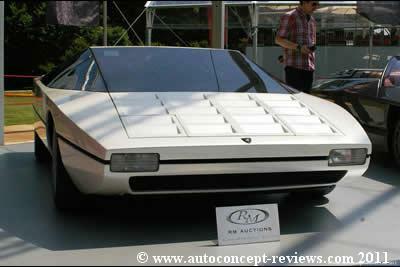 Bertone helped engineer the air conditioning system made mandatory by such a large amount of glass surfacing, which totalled 4,5 square meter (48.4 sq. ft.) and was supplied by Belgian Company Glaverbel. 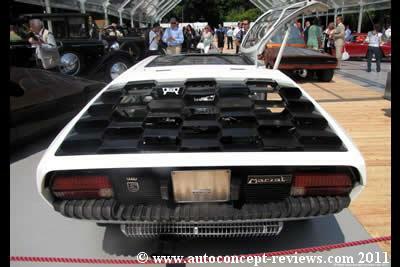 This one off prototype led to the Lamborghini Espada production car. 180 bhp, 5.401 cc. OHV supercharged in line eight cylinder engine, four speed manual gearbox, coil spring double wishbone independent front suspension, swing axle rear suspension with coil spring and four wheel vacuum assisted hydraulic drum brakes. Wheelbase 2,980 mm (117.3"). 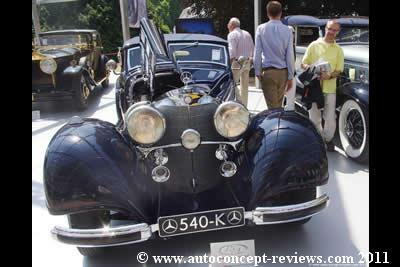 The Mercedes 500K and 540K, with K meaning Kompressor (supercharger), were a development of the Typ 380 with a more powerfull 5 litre engine. 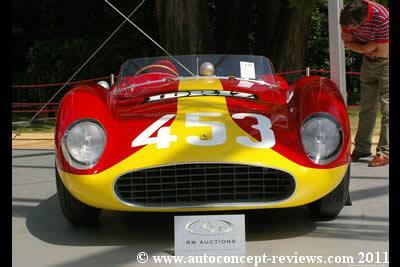 Production of 500K totalled 354 over three years followed by a further 419 540 Ks with larger 5,401 cc. engine. 3,557 cc. in line overhead valve six cylinder engine, Cotal electro-mechanical four speed gearbox, independent front suspension with transverse leaf spring, live rear axle with quarter elliptic springs and four wheel assisted mechanically actuated Bendix drum brakes. Wheelbase 2,900 mm (114"). 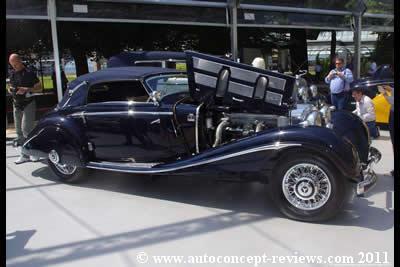 Figoni & Falashi coachbuilders came to the public's attention through their Delahaye designs, when the Model 135 was introduced at the 1936 Paris Salon. The car's low slung rigid chassis and independent front suspension, through an ingenious system of transverse leaf spring and radius rods, light steering and excellent 14 inch Bendix brakes, making it the perfect platform for Figoni's design. 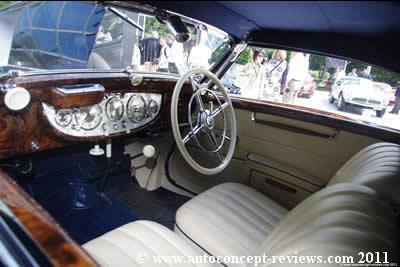 Powered by a 3,5 litre six cylinder hemi-head engine with triple carburettors and up to 140 hp on the MS (Modifiée Spéciale) model, Delahaye coupés and convertibles were as fast as they looked, with up to 110 mph top speed. The MS engine featured bigger cylinder head, larger valves and improved breathing and race tuned versions could generate 160 hp and 125 mph top speed. 115 bhp, 1,584 cc. Narrow angle V4 engine, two twin choke Solex C42 DDHF carburettors, five speed carburettors, five speed gearbox, independent front supension and coil springs and vertical McPherson telescopic damers, four wheel disc brakes. Wheelbase 2,220 00 (87.4”). With the Stratos Zero, Bertone transcended the limits of automotive styling and chiselled a shape that appeared as it were made of solid block of metal, evoking speed and sensation of travel. 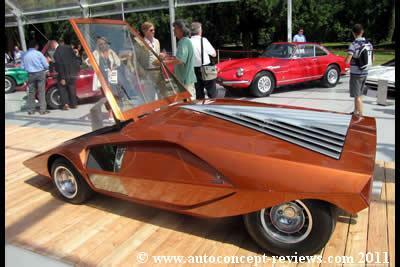 More remarkable still was the fact that the zero was not only a design statement but a fully functioning prototype. The Stratos Zero is a sculpture on four wheels if ever there was one, a true dream car that married concepts of architecture and pure artistic expression and applied them to the automotive object. 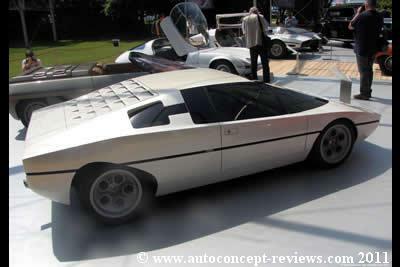 According to Eugenio Pagliano who had joined Bertone’s styling studio as Interior Chief Designer, the initial concept behind the Stratos Zero was simply to see how low a car they could build. 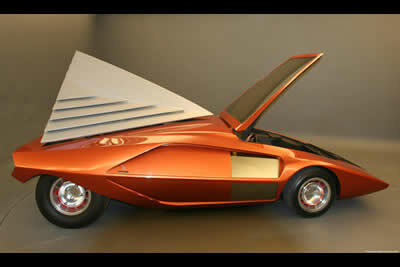 It was a challenge against Pininfarina Modulo 93.5 cm tall when the Stratos Zero peaked at a mere 84 cm (33 inches) from thhe ground. 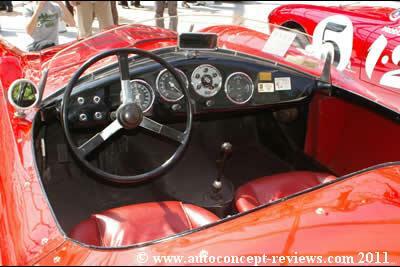 The cabin is so far up front that access is by way of a flip-up windscreen, and a sourced hydraulic linkage was devised so that, as the steering column was pushed forward to enable access to the driver’s seat, the windscreen would lift. The black rectangle at the bottom of the windscreen is in fact a small rubber mat intended to make climbing in easier by first stepping onto the bodywork. 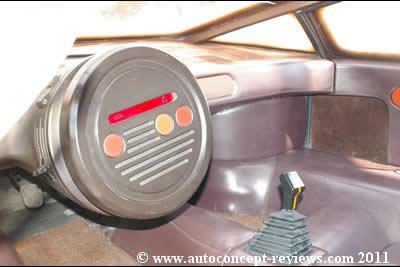 The Lancia badge at the centre of the mat cleverly conceals a pivoting handle that popped the windscreen open. Certainly the seating position is horizontal and as close to the ground as it could possibly be. Luggage compartment is behind the seat. 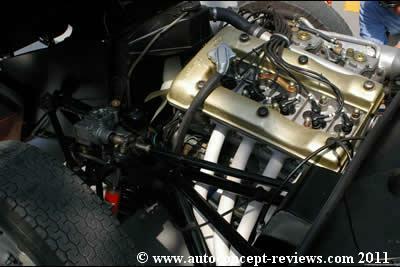 1.6 litre Lancia V4 engine of the Fulvia HF was chosen for its minimal size. A 45 litre fuel tank found space in the right side of the engine bay and twin fans assisted radiator cooling. The spectacular triangular engine cover incorporates slats shaped to direct air towards the radiator which is set all the way to the rear. The BMW 507 was a brief and brilliant reinstatement of BMW’s sporting heritage that had flourished with the successful BMW 328 before World War II. Envisioned by Max Hoffman with a stunning design by Count Albrecht Goertz, it was powered by a 3.2-litre pushrod-operated, overhead valve aluminium block V-8. Production began in November 1956 following an unveiling at the 1955 Frankfurt Motor Show and ended two-and-a-half years later with only 251 examples built, not counting a completely different prototype and two one-offs. 140 bhp, 2,922 cc. Vantage specification DOHC in line six cylinder engine, four speed manual gearbox, independent front suspension with coil springs and trailing arms, live axle rear suspension on coil springs with trailing arms and Panhard rod and four wheel hydraulic drum brakes. Wheelbase 2,515 mm (99”). One of three built. S.H. “Wacky” Arnolt was an entrepreneur with an uncanny ability to spot highly profitable business opportunities. After World War II, he obtained the Chicago area distribution rights for Aston Martin, Bentley, Rolls Royce, Bristol, MG, Riley and Morris automobiles. While some marques proved more successful in the US market than others, within only five years time, “Wacky” was a multi-millionaire and planned to expand his growing business into automobile construction. 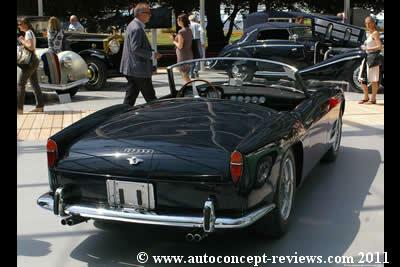 At the 1952 Turin Auto Show W. Arnolt met Nuccio Bertone. 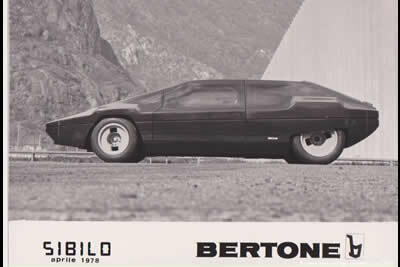 Bertone presented two original concepts based on used MG TD chassis that caught W. Arnolt’s attention. W. Arnolt purchased Aston Martin DB 2/4 chassis and committed Bertone for the construction of lightweight competition spiders. 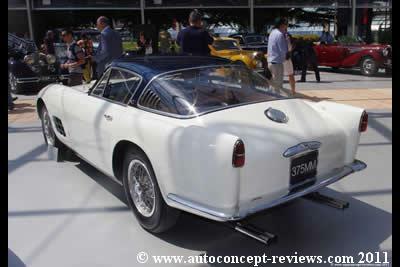 Three cars were completed but Arnolt use of “Arnolt Aston Martin” brand for the cars shortened the factory patience with their American distributor. 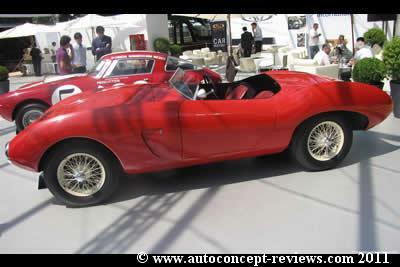 The English marque flatly refused to sell its DB2/4 chassis to Arnolt or Bertone abruptly halting the project. 300 hp, 3,286 cc. 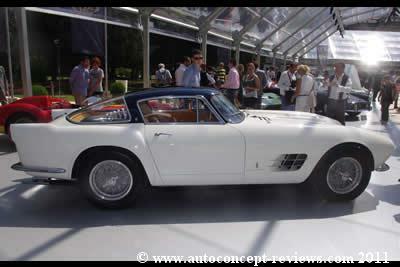 V12 engine with dual overhead camshafts per cylinder bank, six Weber dual choke carburettors, five speed manual gearbox in rear transaxle, four wheel independent suspension with upper and lower wishbones, coil springs and tubular shocks and four wheel hydraulic disc brakes. Wheelbase 2,400 mm (94.5”). 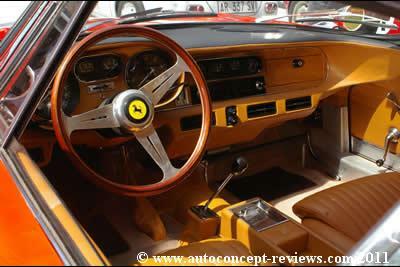 The styling of the 275 GTB unveiled in 1964, is often regarded as being among the purest and most beautiful of any Ferrari built. 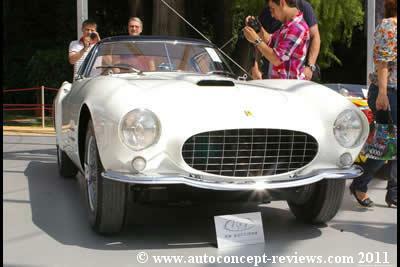 Pininfarina has created a timeless classic of sports car design. 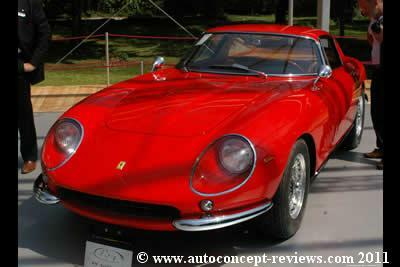 In October 1966 at the Paris Salon, Ferrari upped the ante with the introduction of the 275 GTB/4. 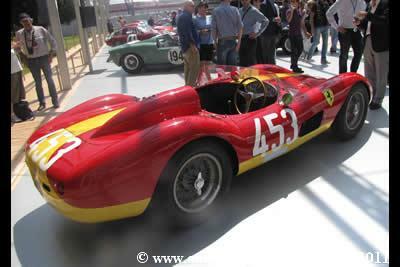 Other than an increase in track by 24 mm, the chassis was unchanged. On the outside the new car is the same with exception of a more bulbous front bonnet allowing six downdraft Weber carburettors. The change in model designation, however, reflected the single but very substantial difference between the GTB/4 and its predecessor; the V12 engine is equipped with four overhead camshafts, two per cylinder bank. The engine provides remarkable mid-range torque and flexibility. Competition power levels have been made available to Ferrari’s clients right off the showroom floor. 330 examples were built. 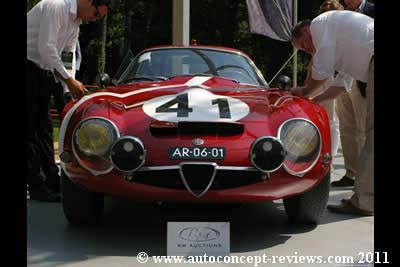 The Alfa Romeo Giulia TZ1 is ranking in rarity with the very best sports cars with only about 112 examples built between 1963 and 1967. 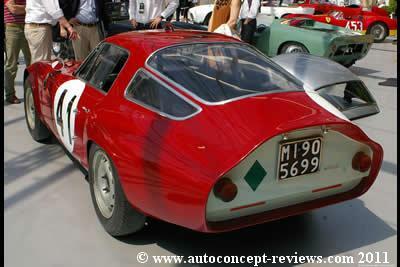 At the October 1963 FISA Cup at Monza, Alfa introduced a competition Giulia, named “TZ” for its “Tubolare” space frame chassis and striking lightweight "Zagato" coachwork. At this race, TZs finished 1-2-3-4 in their class – an extraordinary debut achievement. 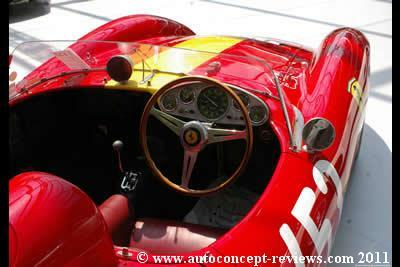 In 1964, the TZ was FIA-homologated and immediately began logging an impressive string of victories. 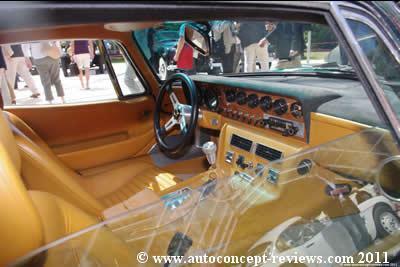 In parallel with V12 powered cars, Lamborghini launched a V8 series with the Urraco in 1970. 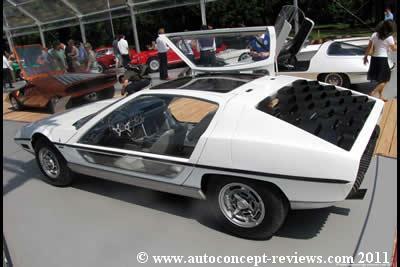 It is on this chassis that Bertone based its third Lamborghini dream car after the 1967 Marzal and the 1971 Countach prototype. 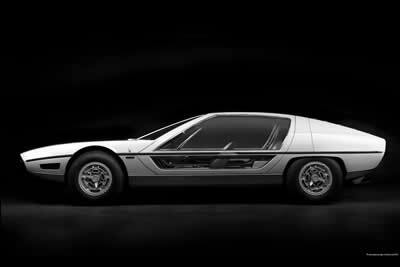 Just as the former two had led to production models, Bertone hoped the Bravo would be adapted into a two seater model to sit alongside the 2+2 Urraco in Lamborghini’s line-up. For this reason, the proposed car is a good 20 inches shorter than the Urraco, with its wheelbase chopped accordingly by è.8 inches. The engine is the three litre unit of the P300 version of the Urraco launched concurrently. 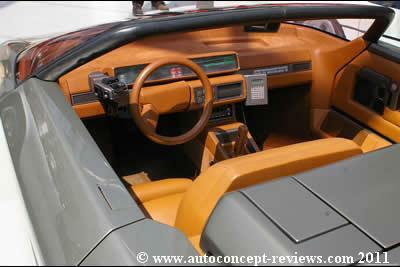 The Bravo’s styling is striking in the vein of Marcello Gandini’s previous styling exercises for Bertone. The sharp wedge shape is cut off by flat near vertical surfaces front and rear. The base of the windscreen is set ahead of the front axle and its very steep angle of rake almost matches that of the front bonnet. 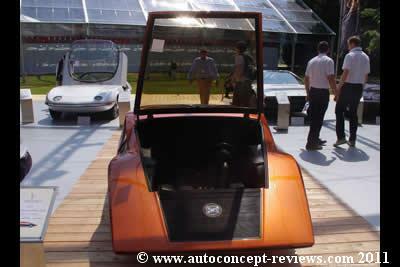 Likewise the surfaces at the top of both front and rear wings gently twist to match the inclination of the side windows. Marcello Gandini complemented this basic shape with some strong graphic features such as the very geometric slats that pierce both front and rear bonnets or the slanted rear wheel arch cut-outs. 355 hp, 5,354 cc. (327 cu.i;.) 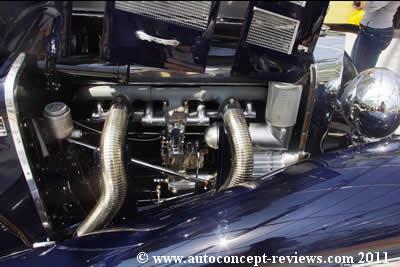 Chevrolet Corvette V8 engine, single four barrel carburettor, four speed manual gearbox , independent front suspension, De Dion rear axle and four wheel hydraulic disc brakes. Wheelbase 2,450 mm (96.4”). While working for Ferrari, Giotto Bizzarini was acknowledged as being largely responsible for the development of both the 250 Testa Rossa and the 250 GTO. 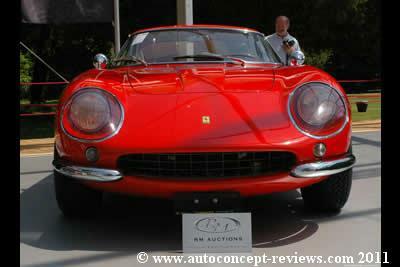 Bizzarini left Ferrari and joined with the successful Milanese industrialist Renzo Rivolta who wanted to build a genuine GT car. 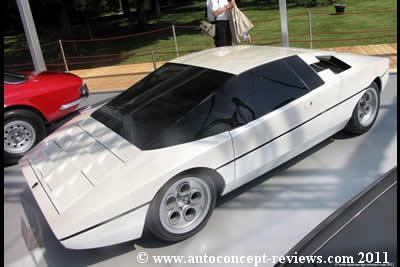 Bizzarini developed an effective platform-type chassis for the prototype Iso Rivolta GT. 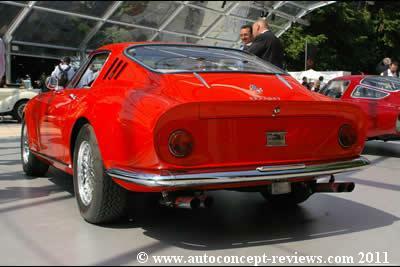 A two-seat GT variant, the Iso Grifo, soon followed, based on a shortened Iso Rivolta chassis. 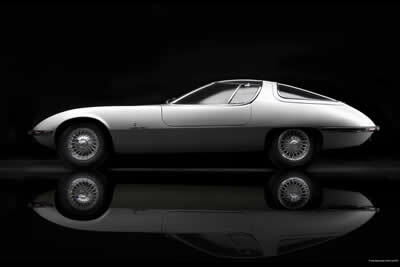 Bertone completed the prototype Grifo Lusso that debuted at the 1963 Turin Motor Show where Bizzarini’s own racing model of the Grifo also appeared identified as an Iso A3C Competition Coupe. Convinced of the Grifo’s competition potential, Bizzarini built his own version of the Grifo for racing and achieved great success, while participating at Le Mans in 1964 and 1965. 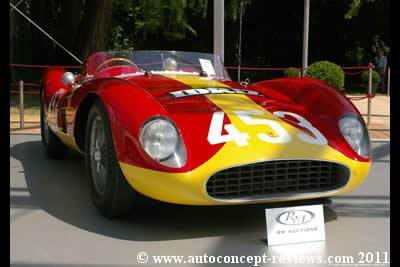 During this period, however, the working relationship between Rivolta and Bizzarini grew increasingly conflicted, as Iso continued to build road going Grifos and Bizzarini focused on racing. A deal was concluded with Bizzarini continuing the production of the A3C in Strada road going form as well as Corsa variants for racing. 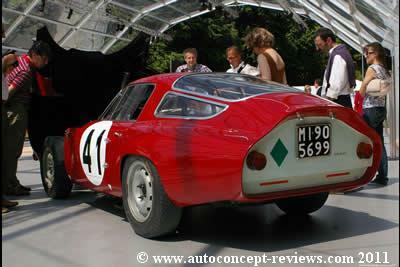 Because of Bizzarini’s predilection for racing, very few examples of the road going 5300 GT Strada were ultimately produced during a six year production run. Production estimates vary between 100 and 149 units, including perhaps 70 alloy bodied cars. 260 bhp, 2,996 cc. transverse mid-mounted 90° V8 DOHC, four inverted twin-choke Weber 40 DCNF carburettors, five speed gearbox, independent suspension front and rear with McPherson struts, coil springs and hydraulic dampers with anti-roll bars, dual circuit hydraulic brakes, 278 mm discs all around. Wheelbase 2,455 mm (96.6”). 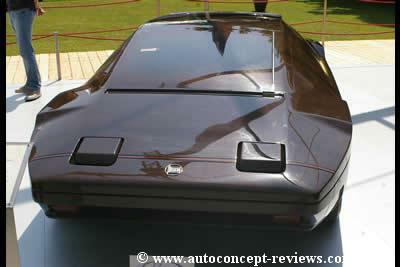 At the 58th Turin Motor Show in 1980, Bertone introduced a new concept car based on Lamborghini Silhouette chassis. 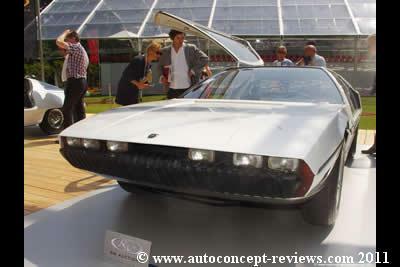 The Athon was the first Bertone concept car created under the direction of Frenchman Marc Deschamps, following the departure of Marcello Gandini. 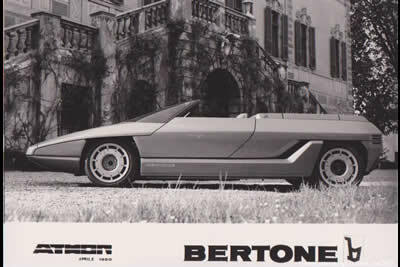 The Athon is based on similar aesthetic codes to the Bertone concept cars shown in 1970s, with tense surfaces and highly sculpted geometric volumes delineated by clear edges and cut-lines. The Athon’s proportion are quite unusual for a spider, with a forward set cabin and a long and relatively tall rear deck underlining the mid-engine configuration. 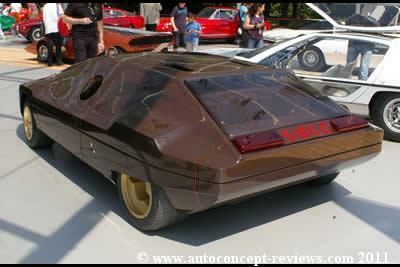 The Athon remained a one off prototype. It is a pity that the designer did not think of providing any weather proof protection. Estimated 81 hp, 2,372 cc. flat six air cooled engine with overhead camshafts and two valves per cylinder, two single choke Rochester downdraught carburettors, four speed manual gearbox, independent suspension with wishbones, coil springs, telescopic dampers and anti-roll bar at the front, semi trailing swing axles, coil springs, four wheel drum brakes. Wheelbase 2,400 mm (94.5”). 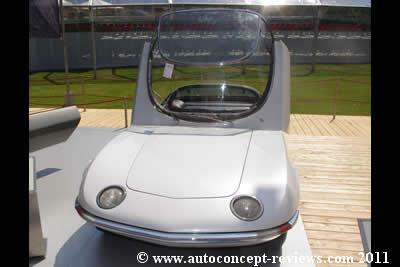 The Corvair Testudo was introduced at 1963 Geneva Motor Show and is the work of then Bertone’s Chief designer Giorgetto Giugiaro. This creation was a signal to the American market. 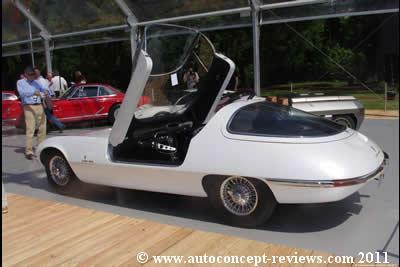 It is believed the Corvair chassis on which the car is based was supplied by General Motors at the time the company introduced its own project Corvair Monza GT. 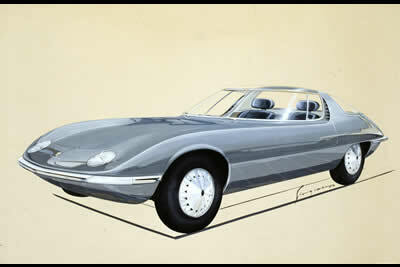 Bill Mitchell was apparently investigating the possibilities of promoting the Corvair in Europe with a locally-styled variant, and there were some exchanges between Bil Mitchel’s studio and Bertone’headquarters as the car was under development in parallel with GM’s own Corvair Monza GT and SS dream cars. 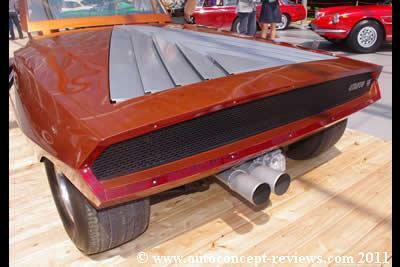 The Corvair Monza chassis was shortened and strengthened without any modification in the drivetrain. The name Testudo – a Latin root for the word turtle, hence the turtle badge adorning the car’s rear- was chosen to symbolise the aesthetic theme. A sharp waistline crease running around the car (extended by the front and rear bumpers) divides the body into a bottom and top half, somewhat reminiscent of a turtle’s shell. 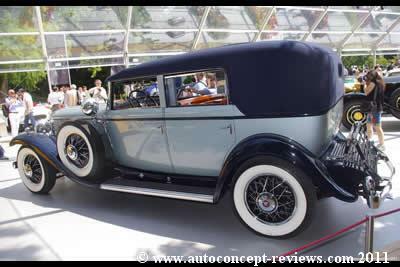 In 1930, Cadillac stunned the fine-car market with the introduction of its breathtaking new sixteen-cylinder models. 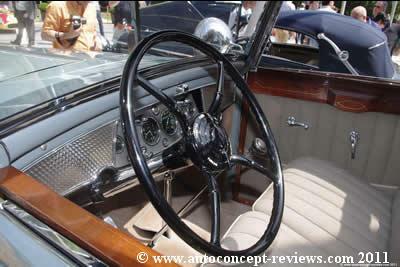 The cars instantly catapulted Cadillac, which until then had been a mid-priced car, to the head of the luxury class. Designed by Owen Nacker, Cadillac’s V-16 was an engineering tour de force, incorporating several unique features. Its 45-degree cylinder bank angle and overhead-valve design kept the engine narrow, while the external manifolding provided good access. Cadillac’s V-16 was the first engine compartment to be styled, with all the wiring hidden and plenty of gleaming, polished aluminium, shining porcelain and a pair of beautiful valve covers with brushed aluminium ridged surfaces. 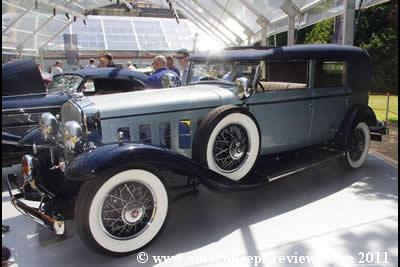 Unlike most builders of fine cars, Cadillac discouraged custom body builders, preferring to direct the business to Fleetwood, the company’s in-house coachbuilder. Only a very few chassis were made available for other builders, so most were forced to buy complete cars, remove the factory body and install their own designs. That, in fact, is what Saoutchik, the extravagant Parisian coachbuilder, did with this outstanding Cabriolet Berline design. 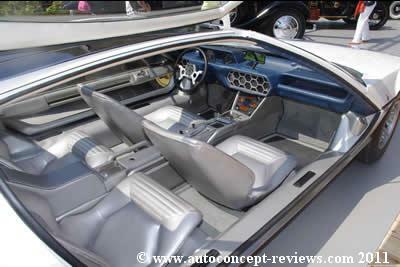 This particular one-of-a-kind body was built with a unique sunroof which opens over the length of both the driver and passenger compartments, sliding down into the rear body as a roll-top desk does. A glass sunroof, which is over the passenger compartment in the closed position, aligns with the rear window in the open position, allowing full use of the window in either position! 190 hp, 2,4 litre Stratos HF Dino V8 mid mounted engine, three Weber 40 IDF carburettors, five speed manual transmission, independent front and rear suspension, four wheel disc brakes. Wheelbase 2,280 mm (89.9”). 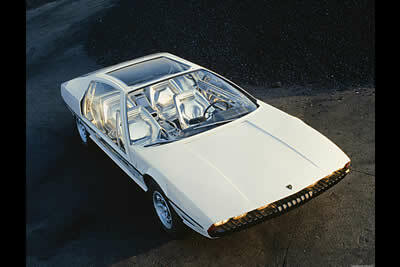 Unveiled at 1978 Turin Show, the Sibilo is another radical geometric development of the wedge shape by chief stylist Marcello Gandini, in which he took themes applied to the Lamborghini Bravo and Alfa Romeo Navajo a step further by blending the glass-house into the bodywork to form a fully integral volume. 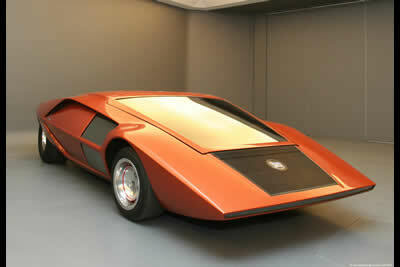 The Sibilo is based on a road going version of the World Rally Championship- winning Lancia Stratos. The windscreen and side glass are fitted flush with the joints filled in and carefully painted to give smooth uninterrupted surfaces. There are no drop-down windows – the side panels are clear plastic with circular openings on each side that pop inwards and then slid forwards on runners.